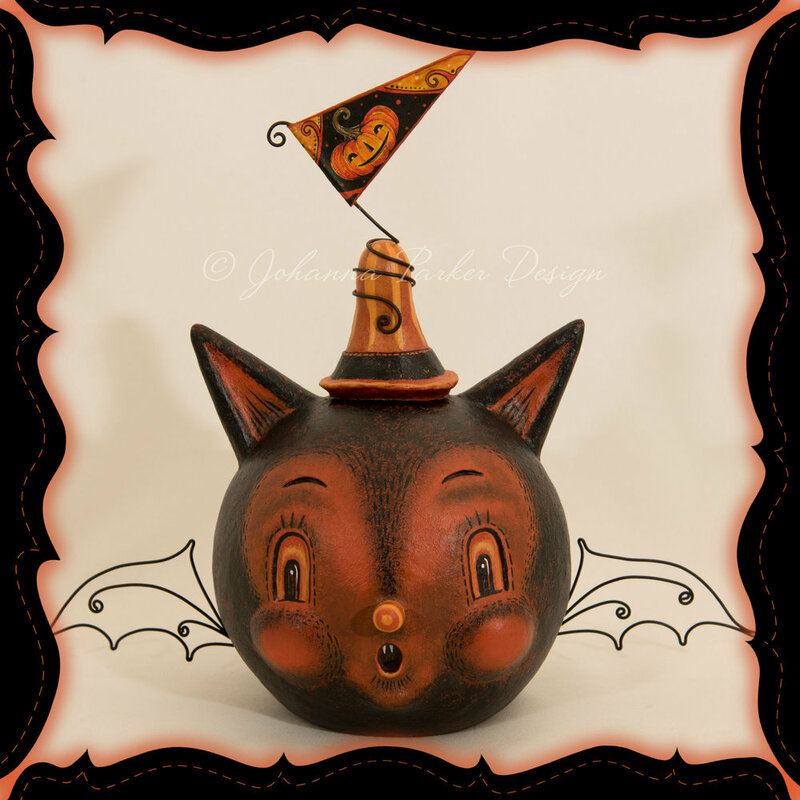 Each character from this special group of 10 one of a kind Halloween Folk Art Originals is up for adoption! Before requesting an original work of art, we ask that you review the details. Please click on their individual frames below for more photos, descriptions and prices. 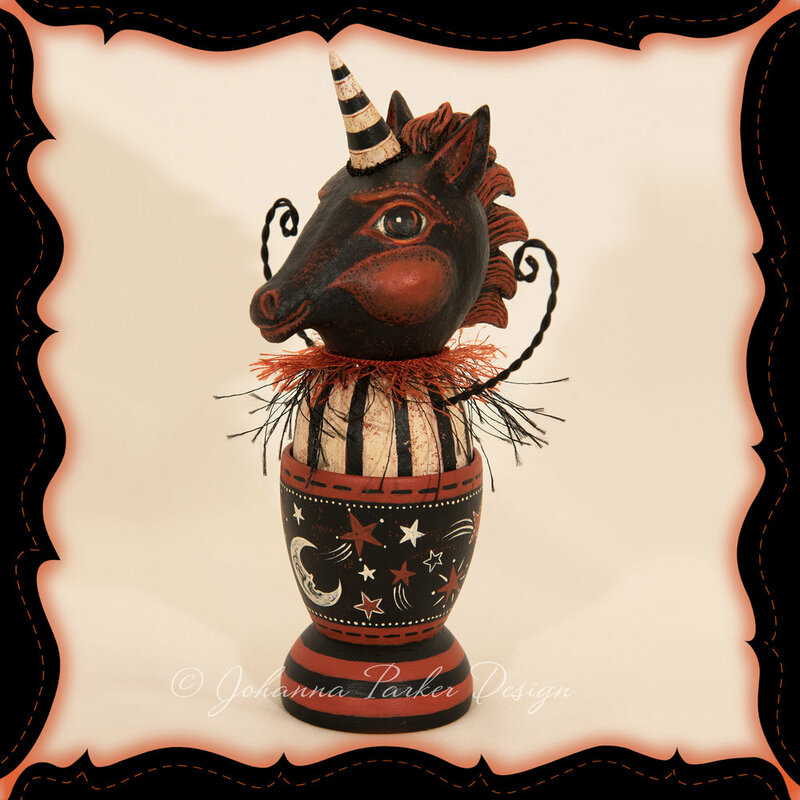 As these are one of a kind Fine Art pieces direct from Johanna's studio, prices of original art reflect the time and attention to detail that both Johanna & JP pour into each hand sculpted folk art creation. Thank you for your folk art appreciation! To request a collectible folk art character, please send us an EMAIL. Your TITLE should include the LETTER CODE associated with the piece. You are welcome to include your "top faves" in the order of your preference. Response time may be delayed due to incoming emails, but we will reply to you as soon as possible. ( A ) "Peter Pumpkin Patch"
( B ) "Monty Moonlight Unicorn"
( C ) "Sparky the Spider Eater"
( D ) "Finnigan Tiny Fang"
( E ) "Costumed Crowzelle"
( F ) "Batzy Owliver"
( G ) "Spooky Duke & Jolly Luke"
( H ) "Green Jack Egg Cup"
( I ) "Moon Star Unicorn Egg Cup"
( J ) "Leo Lantern Love"